This presentation will give clear and practical advice on how to run an incident, what to make sure your Incident Management plan covers and how to pick your team. Based on real life experience and with clear advice and guidance this will give you a real insight into this critical area of Business Continuity. The presentation will be given by David Hutcheson who have well over 10 years experience in the BC Industry. 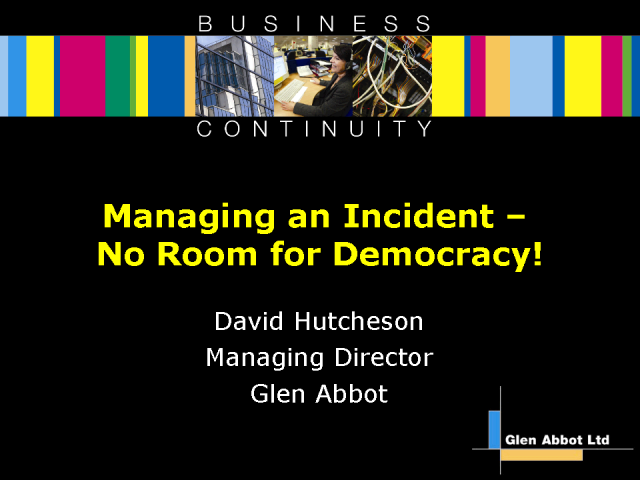 Recently voted CIR Business Continuity Personality of the Year, David is a regular presenter both at conference and webinars.